At Lets-Play-DS.com we're big fans of Hori DS accessories. Hori screen protectors are some of the best available, so we had high hopes for this little carry case. The Hori DS Lite Multi Pouch is a small case, barely bigger than the DS lite itself. Available in a range of colours including black, white, pink and blue, this case has a Velcro fastening flap covering the front compartment and a zip up rear compartment. 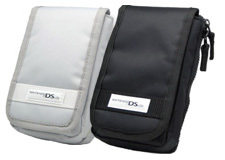 The official Nintendo DS logo adorns the front, proving that this is a carry case Nintendo themselves have confidence in. The DS itself slips into a sturdy holding pocket under the Velcro flap. Unzipping the rear of the case reveals two pockets for game cards and a spare stylus pocket. There's also a small net bag style pouch on the other side of the zip up compartment that can hold your headphones, a Nintendo Gameboy game or whatever you like to carry around. With space for only two games, this isn't perhaps the best case for long journeys, though it's difficult to think where extra games could have been stored in a case as small as this one. At the back of the case there is a Velcro and press stud fastening mechanism which allows the case to be firmly attached to your belt, or even inside a larger case or bag. This double fastening mechanism means the case isn't likely to get yanked from your clothing either by accident or by a shady, opportunistic thief. The case is ultra light and made of soft material. The DS holding pocket is padded but is unlikely to protect the console as well as some of the harder cases. We're fairly confident that the Multi Pouch will protect against accidental dropping and similar day to day shocks, so unless your especially clumsy with your beloved hand-held, you should be fine. If you are looking for a smaller case for your Nintendo DS and you don't mind the limited storage space for games, the Hori DS Lite Multi Pouch comes highly recommended. I have been using one of these cases for over a year now and it still looks as good as the day I bought it. Another great accessory to cheer about from our friends at Hori!